The blog has been dead for quite some time – too busy with work and life to do any camera work, and very little time for actual shooting. But the occassional case of GAS still hits me, and about a month ago, I bought into a Canon LTM rangefinder. I’ve always been enamoured with the old rangefinders – the engineering is incredible. This particular camera was listed as a IID type I, with a fairly limited production. Once I had it in-hand, I realized that it’s a much more pedestrian IIF. Shame on me for not knowing the difference. Live and learn. The camera is in immaculate condition, and came after a recent CLA. Shutter works flawlessly, rangefinder is bright and aligns well. This model has a little magnification switch on the rangefinder to allow other focal lengths, or more precise focusing, but I don’t know that that’s really necessary. To hold, the camera appears, for all intents and purposes, to be brand new. I was smitten when I first received it. Of course, it needed a lens. I’d feel bad cheaping out on a lens after paying a premium for the body (don’t ask me why, though). I went on the hunt for a Canon lens, and found the 50/1.8 in beautiful condition. Within minutes of the package arriving, the camera was loaded with 200 ASA film, and I was off. Then, as so often happens in my household, my attention wavered. I received, for “testing” purposes, a Grubb Aplanatic meniscus lens that would cover my 10×12 well. I quickly shot a few sheets, and now needed money to buy the lens. Hmm – 35mm or 10×12″? No brainer. So, the Canon, with only a handful of shots on the first roll, went up for sale. That was a few weeks ago. No bites. Some interest in the lens, but I’d be taking a bath on any deal offered. I apparently have more money into this rig than what the market will bear, though I think the outfit will prove worth it. After the lack of interest, and with a vacation imminent, I’m holding onto the camera to test it out properly. 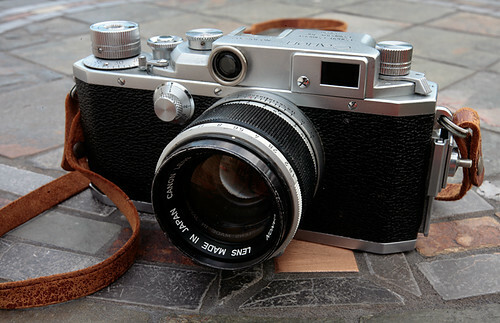 I’ve replaced the cracked and dried leather strap with a nice strap from my Spotmatic. I replaced the batteries in my Gossen Super Pilot. I ordered film. I even found a proper S-42 lens hood for the 50/1.8. I’m loaded for bear. Bring it on.